You may love your iPad, but you can’t deny being a little bit curious about Amazon’s first ever tablet. The Kindle Fire, which was launched in November 2011 in the US, has had hundreds of people speculating over its UK debut, with many reports expecting it to launch in January this year. Yet, it still is nowhere to be seen. So, where is the Kindle Fire? With each new Fire story that comes out, UK consumers are becoming more and more impatient with Amazon, where they can’t understand why it’s taking so long for the tablet to reach the UK. Amazon has seen decreasing sales of its Kindle Fire in the US, and along with the highly successful UK launch of the Google Nexus 7, analysts believe that Amazon will be even more hesitant to launch the Kindle Fire outside of the US. “The performance we saw in Q4 [financial Quarter 4, 2011] has certainly not been sustained into Q1 and Q2 ,” Carolina Milanesi, mobile analyst at Gartner, told ZDNet this week. One important reason why Amazon is holding back from launching the Kindle Fire in the UK could be because of its lack of supporting ecosystem outside of the US. Amazon likely feels comfortable competing in the tablet market when it can supply a full entertainment service on its home ground, with its library of video, music and books, but not so comfortable when it does not have the same offerings in other countries. “So for Amazon moving into a market like Europe, where content offerings would be weaker than in the US, it would make it much harder to compete,” added Milanesi. What do you think? 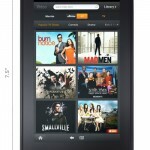 Do you think Amazon should just bite the bullet and release the Kindle Fire here? Or should they wait it out for a little while longer?